Well, it's that time! Time to think about all things pumpkin! I used my last jar of canned pumpkin this past week to make gluten free muffins, so it's time to restock the freezer. You can also can pumpkin, if you want. 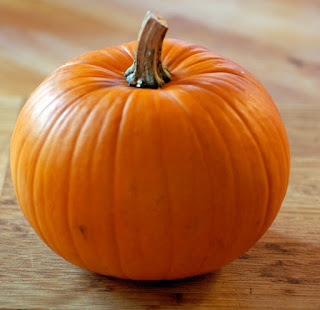 Making canned pumpkin is so easy, you will not believe it! The recipe I use calls for a pie pumpkin, but I have used both and loved both for baking and eating. Pie pumpkins tend to be smaller, sweeter and less grainy. 1. Cut pumpkin in half. 2. Scrape out seeds and stringy stuff (you can wash and roast the seeds in the oven for a yummy snack, wash and dry them and plant them in your garden next summer or throw everything in your garden for volunteer pumpkins next year now). 3. Place both halves cut side down in a 9x13 glass pan. 4. Fill 9x13 glass pyrex pan with 1/4 inch reverse osmosis water. 5. Bake for 30-45 minutes at 350. At 30 minutes prick the pumpkin halves with a fork to see if it is soft. If it isn't soft, bake for 15 minutes more. 6. Let pumpkin halves cool a bit. Then scrape out pumpkin and place in a bowl. 8. Place pumpkin in pint jar, allow 1 inch space at top. Put in freezer! 9. Thaw as needed. And use just as you would a can of pumpkin. 7. Prep pressure can for 11-12 pounds. 8. Cut pumpkin into squares. 9. Place into heated pint glass jars. 10. Fill with boiling water, leaving 1 inch headspace. 12. Add lids and rings. 12. Let pressure canner steam vent for 10 minutes. 13. Put weight on and once gauge hits 11 pounds, start timer for 65 minutes. 14. Maintain 10 pounds pressure. Share your homemade pumpkin recipes! Here's a recipe using "The oils I use" essential oils! !